Last summer, I was biding my time near work, at the corner of Wall Street and Broad, when a group of tattooed people walked past. Like many of the visitors to that section of the city, they were travelers from elsewhere. I learned that these three friends were also educators, enjoying their summer with a trip to NYC. All three of them were open and friendly, allowing me to take photos of their tattoos and to get the stories behind them. 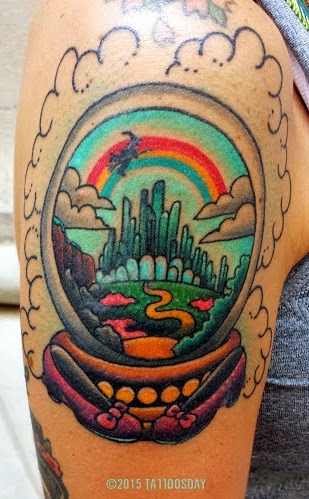 It's a really cool Emerald City image, encompassed in a snow globe, with a flying witch, a yellow brick road and a rainbow. Dorothy's ruby slippers are poised in front of the snow globe. Amie credited the work to "Little" Jen Small from 510 Expert Tattoo in Charlotte, North Carolina. "I'd been wanting something Wizard of Oz because it's my all-time favorite movie," Amie told me, "and I mentioned it to her [the artist] and she ran with the idea and did exactly what I was hoping for." 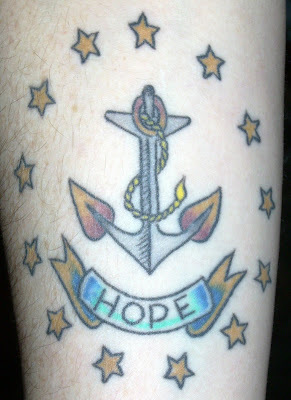 This piece, so colorful, was only two weeks old at the time, so it still had that fresh tattoo sheen. Chad explained, "My tattoo was done by Nate Hudak at Flying Tiger Tattoo in Norwood, Ohio." Norwood is an enclave of Cincinnati. 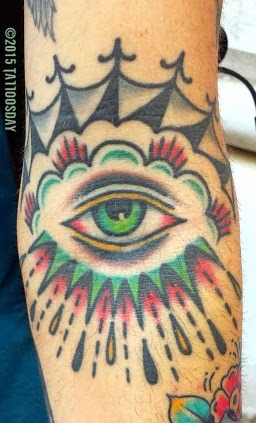 He added, "It's an all-seeing eye ... I'm ... into traditional tattooing and I like the idea of a higher being seeing over, you know, everything." He summed it up succinctly in telling me, "I had mine done by Tommy Partin at Aces High [in Mt. Orab, just east of Cincinnati, Ohio] and mine was just a way to represent being done with teaching." Thanks to Amie, Chad and Tom, this trio of friends, who were all so generous in sharing their ink with us here on Tattoosday! 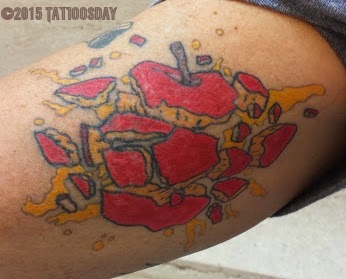 Last week I ran into Ryan, a prior contributor to Tattoosday, who appeared on the site originally here. Ryan told me that he wanted a skull, but with a time theme - so you have the gears of a clock running where the brain is held. He credited the work to Alvin Chong (see his Instagram here) who is an artist from Kuala Lumpur. 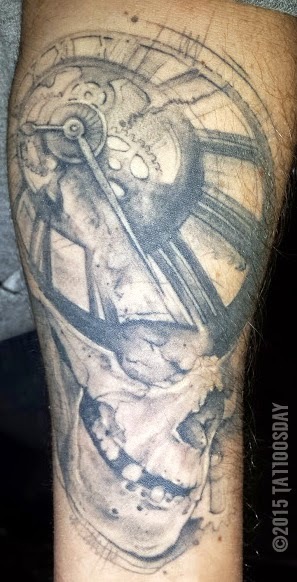 He got this on a recent stint by Chong at Last Rites in New York City. 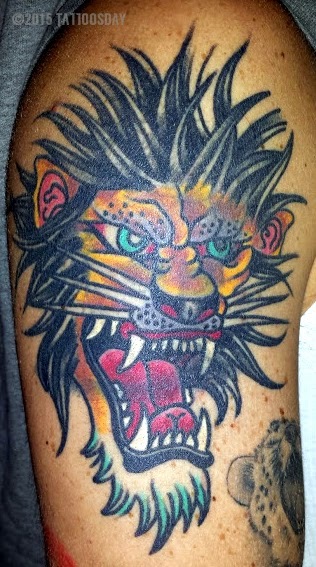 Ryan got this because he is a Leo, and wanted a lion to represent his Zodiac sign. Last summer, I ran into a woman named Fiorella near the subway entrance at Greeley Square. At the bottom of the tattoo is a phrase that reads "What you don't know, you can feel it sometimes." Fiorella explained that she is a student of film making, starting out from her home in Costa Rica, and continuing her studies here in New York City. She is a videographer, whose YouTube channel can be viewed here. 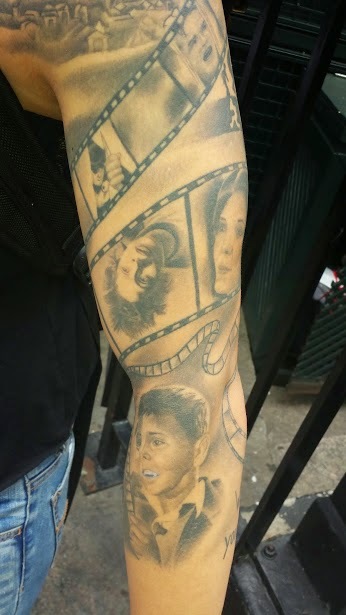 The collage of film images in the tattoo include Amadeus (partially visible in the top photo), Charlie Chaplin (top photo), A Clockwork Orange, Jack Nicholson from The Shining and an image from Cinema Paradiso. She also had images of her family "spliced" into the filmstrip. Her favorite director is Woody Allen. She credited the tattoo to Hiram Cordero at 506 Tattoo Studio in San José, Costa Rica. Thanks to Fiorella for sharing her awesome tattoo with us here on Tattoosday! Something about this post from 2009 jumped out at me, so I thought I'd re-run it today. This tattoo was created at Cherry Bomb Tattoo (now known as East River Tattoo) in Brooklyn by the artist Duke Riley. Work from Cherry Bomb has appeared here previously. This entry is ©2009,2015 Tattoosday. It has been a quiet fall, but we're gearing things up in the new year by sharing leftover work spotted in 2015. This tattoo is on the right thigh of Danielle, who I met back in August in Bay Ridge. 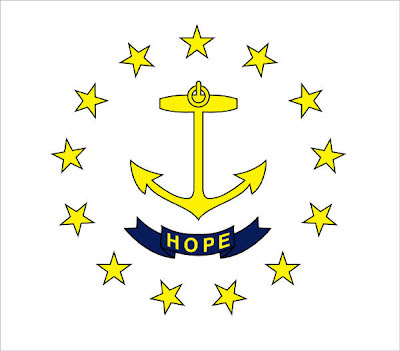 This is a traditional- style piece with a nautical theme. The lighthouse is actually a candle, with a storm approaching - dark clouds and lightning approach. The piece is bordered in rope with a cherry blossom at the bottom. A paper boat floats on the blue sea. 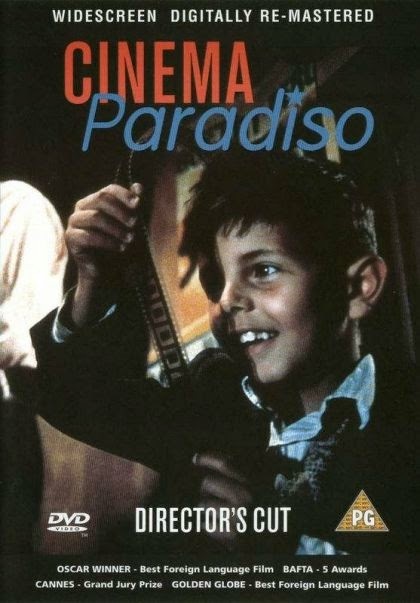 "Basically, it's the light that never goes out. 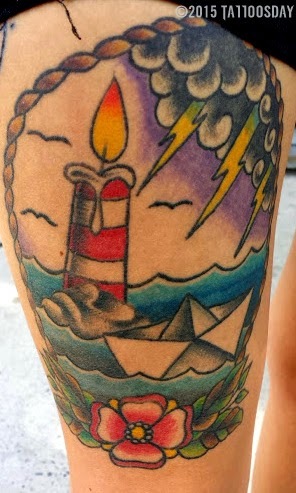 You got the rain, the candle and the candle's still going pretty strong - that's guiding the paper boat." Danielle credited Matt Huff at Brooklyn Ink with this work. Most of her tattoos were done by Matt and the other artists at Brooklyn Ink. Matt had a piece featured over the summer, here, an awesome George Carlin tattoo. Click through the tag for Brooklyn Ink below to see all the work we've featured previously on the site. Thanks to Danielle for sharing this cool tattoo with us here on Tattoosday.